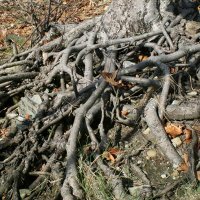 Roots are often overlooked, probably because they are less visible than the rest of the plant. 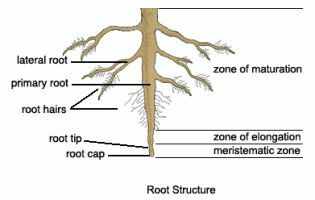 However, it's important to understand plant root systems because they have a pronounced effect on a plant's size and vigour, method of propagation, adaptation to soil types, and response to cultural practices and irrigation. Roots typically originate from the lower portion of a plant or cutting. They have a root cap, but lack nodes and never bear leaves or flowers directly. 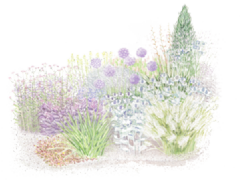 Their principal functions are to absorb nutrients and moisture, anchor the plant in the soil, support the stem, and store food. In some plants, they can be used for propagation. The meristem is at the tip and manufactures new cells; it is an area of cell division and growth. Behind the meristem is the zone of elongation. In this area, cells increase in size through food and water absorption. As they grow, they push the root through the soil. The zone od maturation is directly beneath the stem. Here, cells become specific tissues such as epidermis, cortex, or vascular tissue. A root's epidermis is its outermost layer of cells . These cells are responsible for absorbing water and minerals dissolved in water. Cortex cells are involved in moving water from the epidermis to the vascular tissues (xylem and phloem) and in storing food. Vascular tissue is located in the center of the root and conducts food and water. 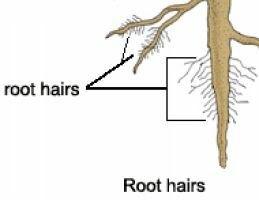 Externally, there are two areas of importance: the root cap and the root hairs. The root cap is the root's outermost tip. It consists of cells that are sloughed off as the root grows through the soil. Its function is to protect the root meristem. Root hairs are delicate, elongated epidermal cells that occur in a small zone just behind the root's growing tip. They generally appear as fine down to the naked eye. Their function is to increase the root's surface area and absorptive capacity. Root hairs usually live one to two days. When a plant is transplanted, they are easily torn off or may dry out in the sun.